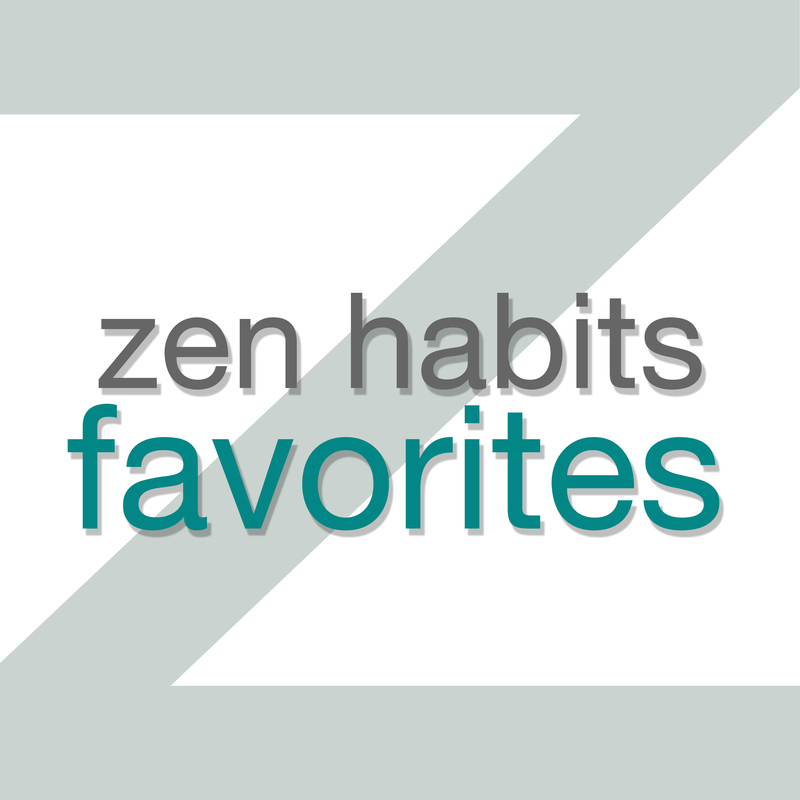 Zen Habits Audio – Page 2 – Home of the Zen Habits Favorites podcast. The more I talk to people about their struggles, the more I realize that we all have some sense of dissatisfaction with ourselves. We constantly have a feeling that we should be better, doing more, more productive, more mindful, and so on. We doubt ourselves when we have to speak in a group or in public, and feel that we’re not good enough to contribute. We are unhappy with certain aspects of ourselves, like our bodies, the way our faces look, the way we procrastinate or get angry or lose patience as a partner or parent. We think we need to improve. This is a constant condition, and even if we get a compliment from someone, we find a way to undercut it in our minds because we think we’re not good enough for that compliment. It affects our lives in so many ways: we might not be good at making friends, speaking in public or in a group, finding a partner, doing the work we’re passionate about, finding contentment with ourselves and our lives. And we don’t like feeling this way, so we run. We find distraction, comfort in food or alcohol or drugs or shopping, lash out at other people when we’re feeling defensive about ourselves. It’s at the heart of nearly all of our problems. So how do we deal with this underlying problem? The answer is profoundly simple, yet not easy. Before I go into dealing with the problem, we should discuss something first — the idea that we need to be dissatisfied with ourselves to make life improvements. I no longer believe this. I do think we’re often driven to make improvements because we’re dissatisfied with ourselves, and that’s not a bad thing. We have hope for something better. When we are unhappy with ourselves, it’s hard to be happy when we do something good. We’re still dissatisfied. So doing something good, then, isn’t the reward it could be. We have habits of running from this bad feeling about ourselves, so procrastination and distraction become the default mode, and this gets in the way of our efforts. In fact, we’ll never solve the problems of distraction and procrastination until we can learn to deal with this problem of unhappiness with self. Unhappiness with self can get in the way of connecting with others (because we think we’re not good enough, and so can feel anxiety about meeting others). We can’t solve this, no matter how much we want to improve, until we address the underlying issue. Even when we make an improvement, the feeling of dissatisfaction with self doesn’t go away. So we try to improve some more, and it still doesn’t go away. In my experience, it never does, until you’re ready to face it head on. During this awesome period of self improvement driven by dissatisfaction, we don’t love ourselves. Which is a sad thing. You can exercise and eat healthy not because you dislike your body and want to make it better … but because you love yourself and want to inspire your family. You can do work out of love for the people it will help. You can declutter, get out of debt, read more, and meditate not because you’re dissatisfied with yourself … but because you love yourself and others. In fact, I would argue that you’re more likely to do all of those things if you love yourself, and less likely if you dislike yourself. What can we do about our continual dissatisfaction with ourselves? How do we deal with self-doubt, feeling like we’re not good enough, unhappiness with certain parts of ourselves? It turns out that these feelings are perfect opportunities — to learn about ourselves and how to be friends with ourselves. Each time we have these feelings, we can pause and just notice. Turn towards the feeling, seeing how it feels in your body. Be curious about how it feels, physically. Instead of running from this feeling, stay with it. Instead of rejecting it, try opening up to it and accepting it. Open yourself up to the pain of this feeling, and see it as a path to opening up your heart. In this way, getting in touch with the pain is a liberating act. See this difficult feeling as a sign of a good heart, soft and tender and loving. You wouldn’t care about being a good person, or a “good enough” person, if you didn’t have a good heart. There is a basic goodness beneath all of our difficulties, and we just need to stay and notice this goodness. Smile at yourself, and cultivate an unconditional friendliness to all that you see. Now, I’m not claiming that this is an easy method, nor that it will cure our difficulties in one fell swoop. But it can start to form a trusting relationship with yourself, which can make an amazing difference. I recommend that you practice this each time you notice self-criticism, self-doubt, unhappiness with yourself, harshness towards what you see in yourself. It only has to take a minute, as you face what you feel and stay with it, with unconditional friendliness. If you really want to focus on this powerful change, reflect on it once a day by journaling at the end of the day, reviewing how you did and what you can do to remember to practice. In the end, I think you’ll find that love is a more powerful motivator than unhappiness with yourself. And I hope you’ll find a friendship with yourself that will radiate out into your relationships with everyone else you know and meet. A Guide to Dealing with Dissatisfaction with Ourselves was first published on Zen Habits on 11/8/16. Throughout the day, we get frustrated, irritated, angry. We are frustrated in traffic, when a loved one doesn’t behave the way we like, when someone tells us we’re wrong, when technology doesn’t work the way we want, when dinner is ruined, among many other daily stresses. These frustrations can build up into unhappiness, relationship problems, work problems, built up stress, blowing your top at someone when you lose your cool. Not always helpful stuff! I’m going to suggest a mindful shift in focus to deal with frustrations. It’s a mindfulness practice, and I highly recommend it. We’ll start by talking about where frustration comes from, then how to mindfully shift. The next time you experience frustration, just notice it. Just be mindful that you’re unhappy with something or someone, that you’re feeling frustration in your body somehow. Pay attention to your breathing, to tightness in your chest or shoulders, to how it feels in your body. Stay with the feeling for just a couple moments, if you have the courage to do so. Normally, we run like hell from paying attention to this feeling, and try to resolve it by fixing the situation, making people behave differently, distracting ourselves, etc. But stay with it if you can. Now notice what it is in this moment that you wish were different. What is missing from this moment that is frustrating you? Frustration stems from what you don’t have. My computer keeps crashing, and I’m frustrated … what I don’t have is a computer that behaves ideally. People are saying things online that irritate me … what I don’t have is a bunch of people who agree with me or behave in the way I want. Traffic backed up and stressing me out … what I don’t have is a stress-free, peaceful drive home. My spouse criticized me … what I don’t have is someone who thinks I’m an awesome husband right now, or their praise. Those are just examples, but in all cases, there’s something that’s missing that I want. Usually it’s an ideal. To start with, just be mindful that you’re frustrated, try to experience the feeling in your body, and then notice what it is you’re missing that’s frustrating you. We get caught up in this story, stuck on it, attached to it. We wish things were different, wish other people would behave differently, wish people could see that we’re right. It’s easy to get caught up. It’s not so easy to notice that we’re caught up, when it happens. But if you can notice it, just notice that you’re telling yourself a story about this situation. It’s a story about how you wish things were different, how things aren’t how you want them to be. Sit and watch yourself get caught up in this story. Sit and stay with the feelings it produces. Then see if you can notice that the story isn’t so solid. It’s not so real. It’s more of a dream that you’re in. Can things lighten up if you notice the dreamlike nature of this story? If we’re focusing on what we don’t have, and it’s frustrating us … then the opposite just might help us. The antidote to frustration is appreciating what’s already here, in this moment. That might not seem true when frustration arises, because the truth is, we just want things to be our way. We just want other people to act the way we think they should act, or want life to go the way we want it to go. Unfortunately, that is usually not going to be the case. Sometimes we can force people to act the way we want, if we have power over them, but that will create a bad relationship with them, and in the end, neither person will be happy. I’m frustrated by my child’s behavior … I can breathe, and appreciate things about this moment: my child is actually a wonderful person, who might not behave perfectly all the time (who does? ), who is alive! And in my life! And I love her deeply. My computer keeps crashing … I can breathe, and appreciate the fact that I have a computer at all, that all my needs are met, that I have people in my life who love me. I can appreciate the break from the computer and stretch, notice the awesome things around me. People say irritating things online … I can breathe, and appreciate: I get to read amazing things online! I’m alive! People are diverse and interesting and messy, and I love humanity for that precious fact. Traffic is backed up … I can breathe, and appreciate the fact that I can listen to some beautiful music in the car, or that I have some transition time between work and home when I can reflect on life, or that I have a home to come back to, or that I’m driving past some beautiful scenery. My spouse criticized me … I can breathe, and appreciate: she’s a great spouse, and a person with a different way of doing things, and I’m happy to have her in my life. And maybe she’s frustrated herself, and could use a hug. This doesn’t mean we should only “think positive thoughts” … quite the contrary, noticing our negative thoughts and staying present with them is important. We can’t avoid the frustration, but we can be mindful of it, and this mindful shift to appreciation of what is can be helpful. I should note that none of this means we should accept abuse or injustice as “OK.” I know that there are incredibly frustrating things about the world today, and that violence, protests, anger, and strife are all around us. This mindful shift I’m suggesting isn’t a solution to all of that. It isn’t a suggestion that you should just be happy with your lot, or accept the world as it is without wanting change. No, I think if there is abuse or injustice, we should compassionately try to correct these tragedies. But learning to deal with our frustrations, in the midst of all this, can actually help the situation. If we can’t deal with our frustrations, then we’re increasingly likely to act in anger and violence, and that isn’t useful. There’s another way: recognize the injustice, be mindful of your frustrations, appreciate life in the present moment to calm your frustrations … then compassionately engage with everyone else to work on righting the injustice. Have a love-driven dialogue with everyone else, rather than fear-based or anger-driven interactions. Stand up to abuse, but that doesn’t mean throw a brick in anger. I don’t have the answers, and my heart goes out to all who are grieving, afraid, hurt, feeling helpless, fed up, frustrated or angry. My only hope is that in the middle of all this sorrow, we can appreciate the gift of life that we’ve been given, and find love for our fellow human beings despite all their flaws and messiness. A Mindful Shift of Focus was first published on Zen Habits on 7/12/16. As you sit here reading these words, you are breathing … stop for a moment and notice this breath. There is peace in just letting your body breathe, without having to do anything about it. Now imagine letting the your hands breathe. Just let them be, without having to control them. Just let them breathe. Now look around you, and notice what else is in the room with you. See each object, and let it breathe. If there are any people in the room with you, in your building, or in nearby buildings our houses … see them in your mind and let them breathe. When you let them breathe, you just let them be, exactly as they are. You don’t need to change them, don’t need to control them, don’t need to improve them. You just let them breathe, in peace, and you accept that. You might even smile at this breathing. As you go through your day, let everything breathe. Let yourself breathe. There is no need to do anything. You don’t expect anything from anything or anybody. Just let them come as they come, let them go as they go. Just appreciate everything and everybody as they are, miracles of existence, breathing in the soft air of the world, and smile at this joyful manifestation of love. Let Everything Breathe was first published on Zen Habits on 2/4/16.